Wondering How To Choose The Perfect Men's Gift Hamper? Here's How. Never disappoint him again! When you choose The Hamper Emporium, you're choosing Australia's finest gifts for men, delivered free, directly to his door! You're joining a crew of over 200,000 satisfied customers and counting. The Hamper Emporium's selection of luxury men's gift hampers includes gourmet chocolates, ciders and nibbles that are sure to impress even the fussiest of men. We understand that sometimes finding gifts for men or your Dad, boyfriend or even father in law can be hard, so The Hamper Emporium has put together a range of gifts and gift hampers that will suit even the hardest to buy for man. Find unique hampers for the man in your life and treat him with a gift hamper full of delectable treats to suit every taste. The stunning hampers collection is made especially with men in mind. The gifts of fine wine and food strikes the right note and is the best way to let someone special know you’re thinking of them. Letting gift hampers carry your message to someone special in your life is by far the best way to show them you're thinking of them, and you have our wonderful collection of men’s hampers to choose from! Whether you choose traditional treats or contemporary gifts, hampers from The Hamper Emporium are carefully designed and beautifully packaged to pamper, surprise, or indulge. The Hamper Emporium regularly provides gift-giving guides, which helps customers to find the best gift hamper for their recipient. Today, we focus on gift hampers for him, so if you are looking for the best hamper for a male recipient, we can certainly suggest reading the information below. What Do You Put in a Christmas Hamper for Him? Christmas hampers for him may contain a large selection of products, but most of them will have a Christmas theme. Christmas-themed products can be regular gourmet products with festive packaging, or a genuine Christmas treat such as shortbread or fruitcake. The Christmas hamper is not just characterised by the Christmas-themed products it contains, since the overall presentation of the Christmas hamper for him will also impact the suitability of a hamper for the holiday season. So, if you are looking for a good Christmas hamper for him, make sure the presentation of the hamper matches the holiday season too. Of course, any of our men's gift boxes can be gifted during Christmas, or for any occasion really, because we've spent over a decade ensuring that our hampers are packed full of the finest gift products in Australia, backed by the best brands and stunning presentation. What Gift Hampers Are Best As A Father’s Day Gift? At The Hamper Emporium, you can certainly get a better idea of the products that are commonly used in Father’s Day hampers. Our Father’s Day hampers tend to contain products such as premium whiskey, but also gourmet biscuits and nibbles. Since this type of selection appeals to most Australian men, gift hamper options are almost limitless for customers. Does The Hamper Emporium Provide Mother’s Day Hampers too? Yes, it's not just about men around here of course! The Hamper Emporium also offers a lovely selection of Mother’s Day hampers. To locate our Mother’s Day hampers, simply head over to the main menu and select “Mother’s Day” to see our full range of Mother’s Day hampers. Are you looking to obtain some Mother’s Day hampers outside of Mother’s Day? Find some appropriate gift baskets in our “for her” range, which contains hampers solely made for female recipients. What Are the Most Popular Hampers for Him in Melbourne? The popularity of gift hampers for him can vary according to region. For example, Melbourne customers will find that certain hampers are more popular in their region than in Sydney for example. Below, you can find some of the most popular gift baskets for him for Melbourne. Our Foodies Hamper is an extremely popular choice for gourmet lovers. It contains pantry items that can transform any gourmet meal into a masterpiece, but also gourmet nibbles that your recipient can enjoy on their own. 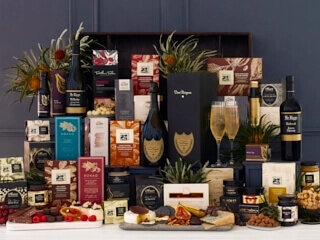 A good hamper for him can certainly benefit from an excellent wine, this much is proven by the second most popular hamper for him in Melbourne, the Red Wine & Nibbles Hamper. Inside the Red Wine & Nibbles Hamper, customers can find a genuine Robert Oatley McLaren Vale Shiraz, but also gourmet crackers, nut mixes, and delicious tapenade! A large collection of gourmet nibbles goes down well with Melbourne recipients, so our next choice is the Ultimate Foodies Hamper. 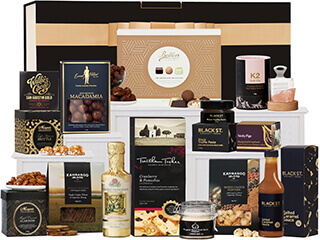 Providing award-winning pantry items from Black St. Gourmet, as well as countless chocolates, your Melbourne recipient will be delighted with this exquisite selection of treats. What Are the Most Popular Hampers for Him in Sydney? As explained briefly earlier, the hamper preferences can vary by region. Below, you can find popular options for Sydney recipients. So, if you are buying for someone in Melbourne, be sure to pick up one of these options. 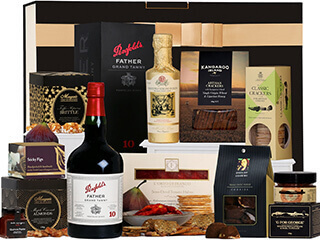 Sydney recipients certainly appreciate a good combination of sweet treats and a decent wine, which immediately explains the most popular hamper among Sydney recipients, the Ultimate Foodies Hamper with Shiraz. 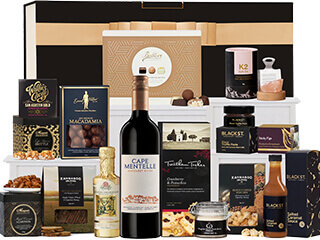 Inside this hamper, recipients can find Cape Mentelle shiraz, complemented by chocolates from Willie’s Cacao, Ernest Hillier, and Butlers Irish Chocolates. Of course, this hamper also provides award-winning gourmet treats from the Black St. Gourmet brand. The love that Sydney recipients have for a good bottle of bubbly once again shows with the Vintage Moet Hamper, the second most popular hamper for Sydney. Inside this hamper, your recipient will find a genuine 2018 Moet Grand Vintage, a rare release from the Moet & Chandon champagne house. Of course, it also contains gourmet treats from Baylies, Morgan’s, and Gourmet Regional to supplement the exquisite flavour of the vintage champagne. For Sydney recipients, you could also consider one of our premium whiskey hampers. The third most popular option is the Glenmorangie ‘the Lasanta’ Hamper, which includes the exclusive Glenmorangie Lasanta Whiskey. The Glenmorangie Lasanta is a 12-year-old single malt whiskey. It is characterised by numerous flavours, including honey, dried fig, and chocolate, making this one of the more exotic whiskies in the world. Of course, when you choose Glenmorangie, you immediately choose one of the best whiskey labels in the world. 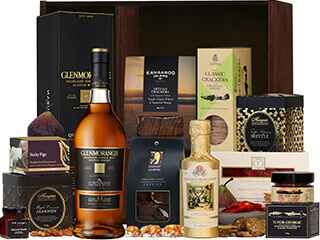 With Glenmorangie, quality is always guaranteed, so this hamper containing the Glenmorangie Lasanta and accompanying treats will be a big hit among Australian whiskey lovers. Make the man in your life feel special with golden sparkling French Champagne. The gift hamper is paired with handmade chocolates that are sure to impress any chocolate lover. The gift hamper is beautifully packed in a luxury keepsake box and finished with a beautiful fabric ribbon. The hamper includes a quality selection of beers, ales, and lagers. It also includes quality nibbles for a treat that’s sure going to impress your man. We love celebrating the best of Australian produce here at The Hamper Emporium, and we've worked with some of Australia's most celebrated craft brewers to create the ultimate craft beer gift hamper, guaranteed to impress even the fussiest beer drinker. What Are the Best Thank You Hampers from the Men’s Hampers Range? All hampers in our men’s hampers collection could double as thank you hampers. Of course, there are other categories on the Hamper Emporium where you might find good thank you hampers too; this includes our gourmet food & wine section. When it comes to finding the best thank you hampers, it is always best to consider your recipient’s personal preferences. Simply check the available categories and choose the category where you will find many thank you hampers that will match your recipient. For example, if your recipient is a chocoholic, you will find the best thank you hampers in our chocolate hampers section! What Are the Best Get-Well Hampers for Men? Do you need a get-well present for your recipient? Be sure to consider any of the get-well gift hampers at The Hamper Emporium, which contains some amazing pampering gifts your recipient is bound to appreciate. Inside our get-well hampers, you can find items such as grooming products, but also chocolates and sweet nibbles, which are bound to make your recipient feel a whole lot better! What Are the Best Men’s Valentine’s Hampers for Men? There are some Valentine’s Day gift hampers you could consider for your recipient. 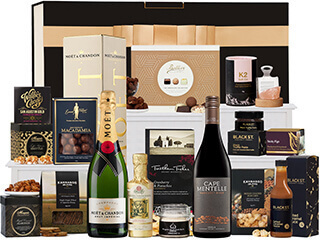 Some of the most popular Valentine’s Day gift baskets for men include the Luxury Hennessy Hamper, the Ultimate Foodies Hamper, and the Vintage Moet Hamper. However, there are a lot more gift baskets that are suitable for your male recipient this Valentine’s Day. What Are the Most Popular Christmas Hampers for Men? The Hamper Emporium does not only provide suitable gift baskets for Valentine’s Day, but also some amazing Christmas hampers. For Christmas, you could consider gift baskets such as the Glenmorangie 10-Year Original with Whisky Tumblers, the Classic Celebration Hamper, and the Sweet Epicure Hamper. There are more hampers for Christmas that your recipient might love, so be sure to check out our entire collection of Christmas hampers for men, not just our most popular ones! Inside our range of gift hampers for him, customers can find a variety of products. Our range includes excellent alcoholic beverages, which includes Glenmorangie whisky, Moet & Chandon champagne, and numerous gourmet treats obtained from Australian and international gourmet brands. We also have a beautiful range of beer hampers, which are bound to be appreciated by the beer lovers amongst recipients. However, customers must know that our beer hampers range offers more than standard beers alone, because our range includes international beers from countries such as Germany and Belgium as well! So, check out our latest gifts for him if you still need a present that will impress your recipient. There's a reason we've delivered hampers to over 200,000 happy customers. Our hampers truly are Australia's best. I would just like to express my gratitude to The Hamper Emporium who from the onset, right through to the delivery were helpful, patient and eager to assist. I would also like to congratulate you on your service as well as the exquisite look and quality of the hamper. I will be your greatest advocate and a customer for life. What excellent service The Hamper Emporium provided us and all the hampers looked so lovely and were very gratefully received!! Our Board members were very excited and impressed by them. We will definitely be in touch with you again for all our hamper requirements in the near future. Just a quick email to say, how impressed I was with your fast service today. I will definitely be using The Hamper Emporium again.